WASHINGTON (CNN) -- Democrats in Congress face a tough decision on a bill funding the wars in Iraq and Afghanistan that does not include a timetable for withdrawal of U.S. troops. Vote "yes," and they are certain to face the wrath of anti-war forces in their political base. Considering those unhappy options, Democratic leaders in the House and Senate decided Tuesday to remove timetables from the bill. President Bush has promised to veto the bill if it does include a withdrawal deadline, a move that would mean delaying much-needed funding for military operations. But conveying the Democratic leadership's hesitation to the president, House Speaker Nancy Pelosi said members would not be forced into voting for the bill. 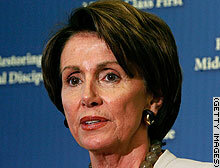 "I'm not likely to vote for something that doesn't have a timetable or a goal of coming home," Pelosi said. Anti-war groups are furious at the decision of Democratic leaders to remove the timetables. MoveOn.org released a statement saying it would consider recruiting primary challengers to lawmakers who support the bill, as well as advertising against them in their districts or states. "Voters elected Democrats in November to lead the way out of the mess in Iraq," said Eli Pariser, executive director of MoveOn.org Political Action, who decried the bill as "just a blank check for an endless war." The pressure the funding measure is putting on Democratic senators running for president was clearly evident Wednesday. At a press conference on an immigration bill, Sen. Hillary Clinton of New York deflected a question about how she would vote when the Iraq funding bill comes to the floor Thursday, saying the query was off subject. As she left the event, she again declined to answer, saying she had not seen the final version of the bill. Reminded that the bill would not include timetables, she responded with some frustration, "When I have something to say, I'll say it, gentlemen." Sen. Barack Obama of Illinois had a similar response, telling reporters that he hadn't "seen a final product" and didn't want to comment "until I do." "I actually want to read the provisions before making a statement on it," he said. "Alright?" Other candidates announced their decisions. Sen. Chris Dodd of Connecticut said he would vote against the bill, urging his fellow senators in a statement to "stand up to this president's failed policy now." But Sen. Joe Biden of Delaware said he would reluctantly support the war funding measure, even though he doesn't like it. "The practical reality now is, for now, those of us who want a change in course in Iraq don't have the votes," he said. "I wish you could end it today. But I'm not going to vote to leave the troops without money." Former Sen. John Edwards, who is running third in the polls behind Clinton and Obama, sought to ratchet up the pressure on the front-runners to oppose the bill, denouncing it as a "capitulation" to Bush. "What I'm asking is for the Congress to stand its ground, to do what it needs to do for America," Edwards told CNN's "The Situation Room." "This is not about politics. It's about life and death." When he was in the Senate in 2003, Edwards voted for the resolution authorizing President Bush to take military action in Iraq, but he now says that vote was a mistake. The lone House member running for the Democratic nomination, Rep. Dennis Kucinich of Ohio, voted against authorizing the Iraq invasion and opposes any more funding for the war. "It is simply not credible to maintain that one opposes the war and yet continues to fund it," he said. House Speaker Nancy Pelosi said Wednesday: "I'm not likely to vote for something that doesn't have a timetable or a goal of coming home."